Today we are celebrating the birthday of one of Spitalfields’ best-loved residents, Mavis Bullwinkle. We count ourselves favoured that, apart from her six years enforced exile as an evacuee in Aylesbury during World War Two, Mavis has shown the good sense to spend her entire eighty years here. 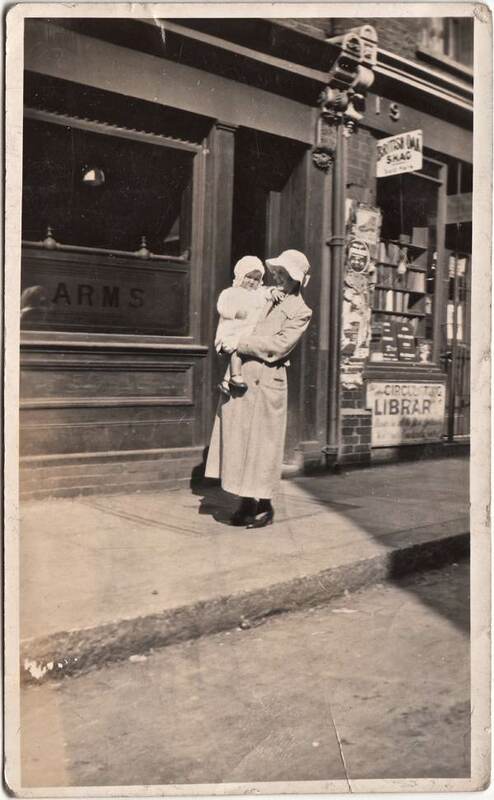 In this picture, you can see her standing at the door of the church house in Buxton St where her grandfather Richard Pugh lived when he came from North Wales as a lay preacher in 1898 to minister to the people of the East End, and it was here that Mavis’ mother Gwen was born in 1899. I regret that we cannot turn back the wheels of time, so that Richard could step through this door to wish his granddaughter a happy birthday, but the unfortunate reality is that he died of pneumonia in 1905 and left Mavis’ grandmother to bring up seven children alone – an event which created repercussions that resonate to this day for Mavis. Yet Mavis displayed her characteristic good humour, amplified by her bright red ankle-length raincoat, when I met her outside Christ Church after morning prayers on an especially grey and cloudy morning this week. 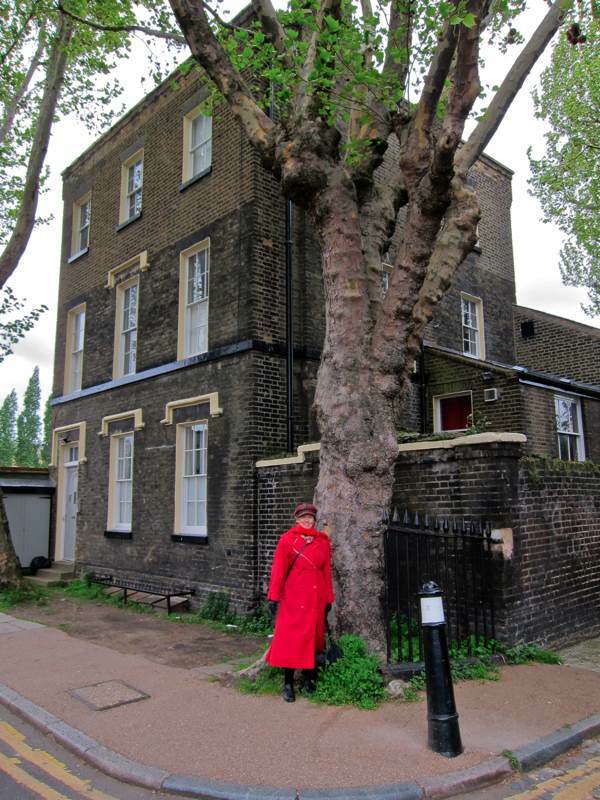 And it was my privilege to take a stroll around the neighbourhood with Mavis, as she pointed out some of the landmarks on her personal landscape, because after her eighty years, there are few who know Spitalfields as well as Mavis. Already the rain was setting in, so we set off briskly towards the Hanbury Hall and Mavis ameliorated her opinion of the place by the time we got there. “My uncle and his family lived here on the ground floor,” she explained, “the bedroom was on the right of the entrance and the living room and kitchen to left.” Mavis told me there was so much unemployment in the nineteen twenties that young men were encouraged to go to Australia and, eager to relieve the burden on his mother, Albert emigrated at nineteen, only to have an accident in the Outback that left him with a curvature of the spine. On his return, he found it even harder to get work until the rector of Christ Church appointed him caretaker. And when he died young in 1943, leaving a wife and two girls, the Rector arranged for them to have a flat in the market building at the corner of Brushfield St. Mavis taught at the Sunday School here at the Hanbury Hall from 1951 until 1981, while the congregation was in exile, and she stood in the rain looking up at the building in disbelief that so much time could have passed. The nature of our odyssey caused Mavis to peer in wonder at her familiar streets. “When you live in a place so long you take it for granted, until it’s not there anymore and then you can’t even remember what was there before.” she confessed as we turned from Brick Lane into Buxton St, approaching Allen Gardens. 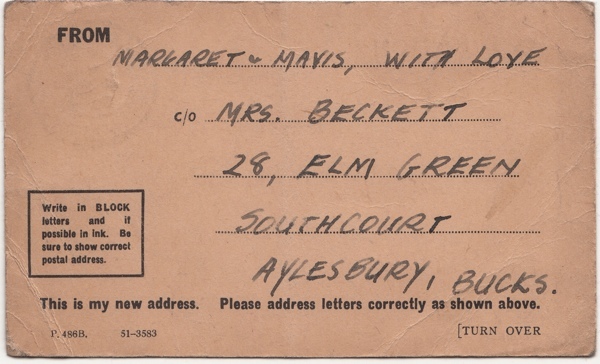 Before the green field that we know today, Mavis recalls a warren of little streets here surrounding All Saints Church, the centre of her emotional and social universe growing up in Albert Family Dwellings in Deal St. This was the block her grandmother moved into in 1905 and Mavis moved out of in 1979 when it was demolished. From here, we walked down Deal St where Albert Family Dwellings formerly stood on the south corner of Underwood Rd. Only the the iron bollards labelled M. E. N. T. remain today to indicate that this was once Mile End New Town. 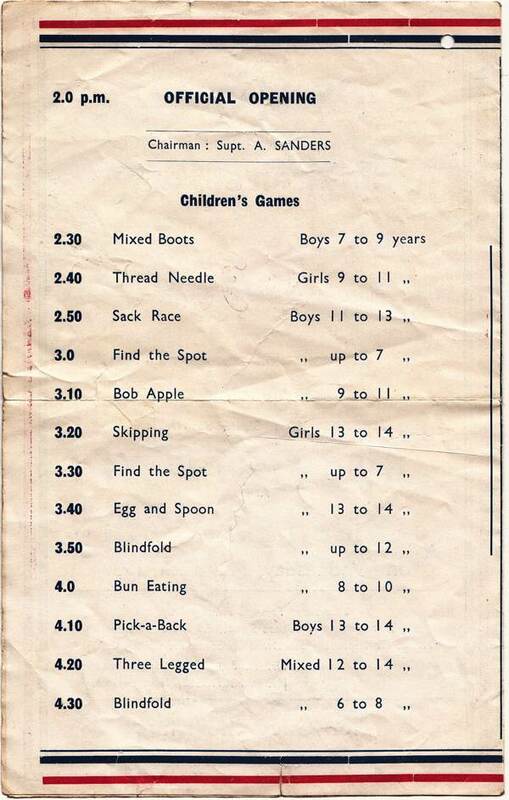 Yet in Mavis’ mind it all still exists – the Prince of Wales pub on the corner of Buxton St, Davis’ Welsh Dairy on the north corner of Underwood Rd and Mrs Finkelstein’s sweetshop opposite, where for penny you could put your hand in a bran tub and get a little thing to put in your dolls’ house. Standing outside the former entrance of Albert Family Dwellings, Mavis recalled the evening of 2nd September 1939 when she and her sister Margaret were summoned to the school to be evacuated without being told where, and Mavis’ mother went home alone clutching a card with her daughters’ address in Aylesbury. Today, Mavis is probably the only witness to the former life of these streets that still resides in this location and the empty pavements are crowded with memories for her. Mavis gave up a career in the City in preference to a lower paid job as a secretary at the Royal London Hospital because she wanted to be of service to people, and she worked there for forty years. Her grandfather Richard Pugh, the lay preacher from Wales, would have been proud of Mavis, following his example. 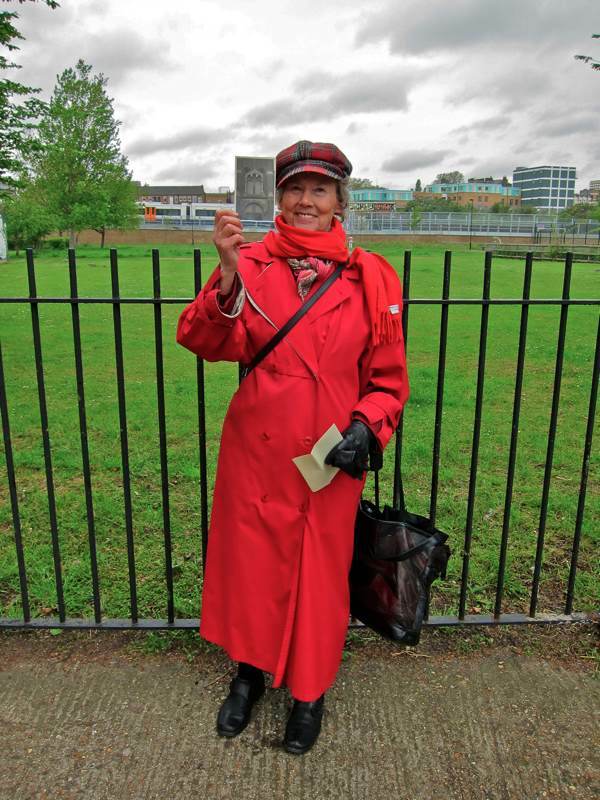 The last of the Bullwinkles in Tower Hamlets, she fills with delight to speak of Spitalfields, and more than a century of striving and thriving in her family in this corner of the East End. Out of almost everyone I know, Mavis could most be said to be of this place. With a self-effacing nature, she has shown moral courage and selflessness in her work at the hospital, and in caring for her mother and two aunts until they died at ripe old ages. After eighty years, Mavis Bullwinkle knows what it means to live, and we salute her example and applaud her spirit. 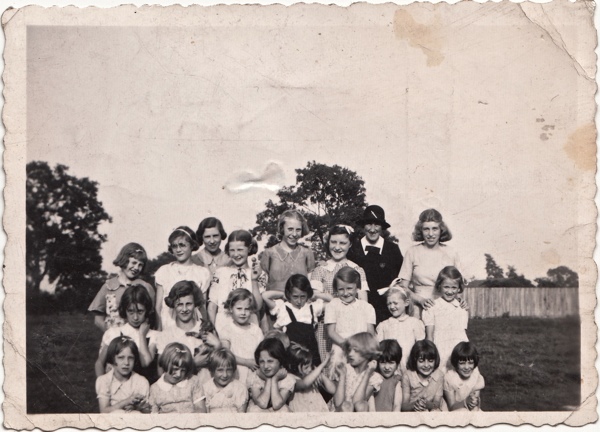 All Saints Sunday School in 1939 – seven year old Mavis is in the second row on the extreme right and her five year old sister Margaret is on her right. 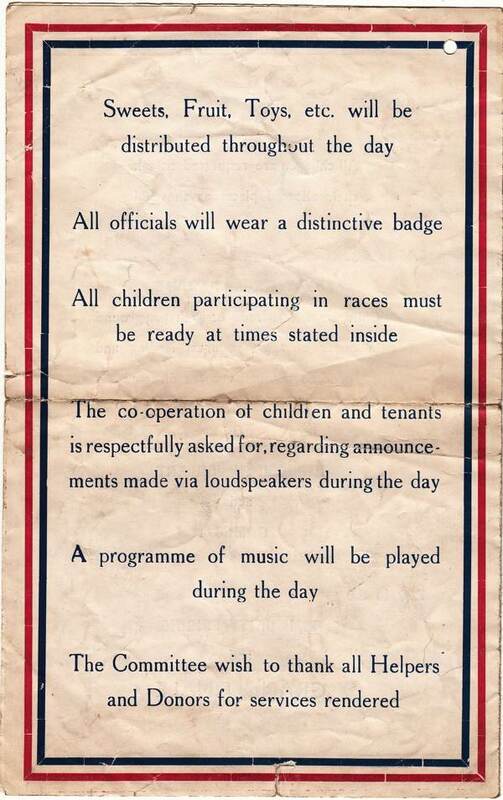 Mavis & Margaret’s evacuation card, 1939. 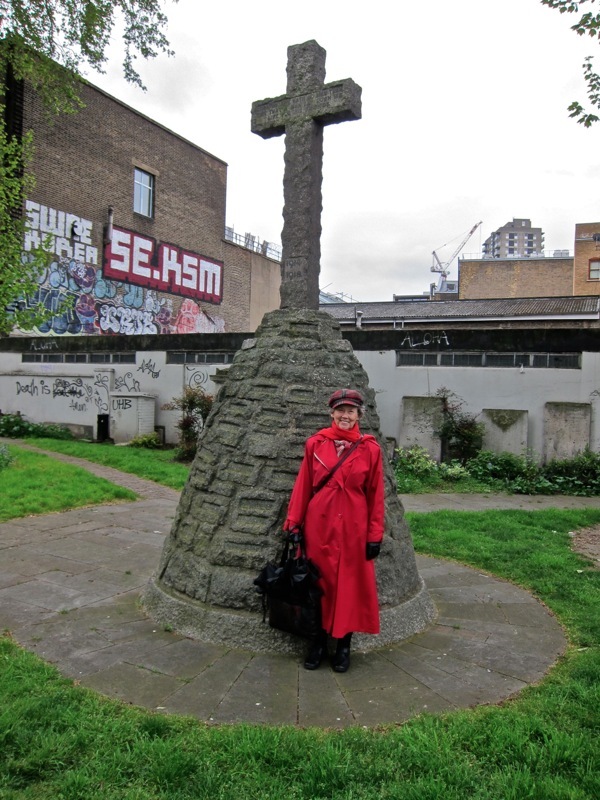 Mavis stands on the spot where All Saints Church used to be in Buxton St until 1951. 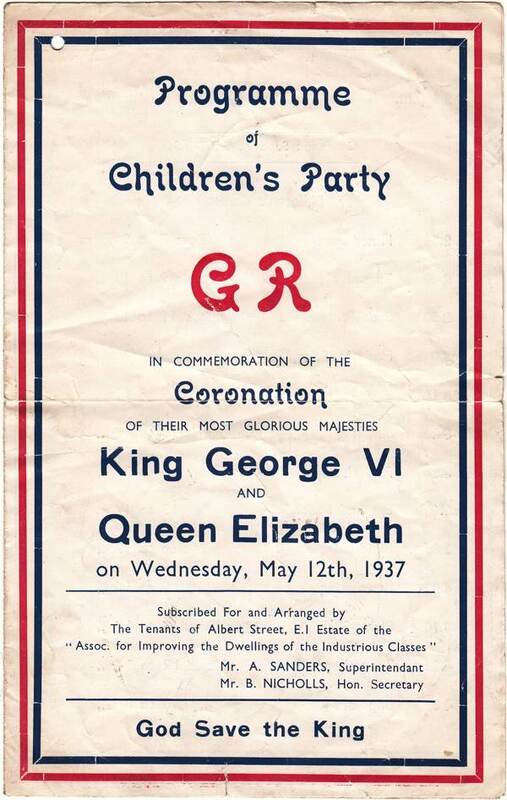 Spitalfields’ celebrations for the coronation of King George VI, 1937. A most happy birthday to you Mavis. May the coming year be filled with joy and great health. Best wishes all the way from Portland, Oregon to you on this lovely day. You are an inspiration; thank you to you and the gentle author. Through your story, I see my family – the gentle author brings it to human life which we all are but sometime forget. Happy birthday to a lady — a Londoner — who is unparalleled. 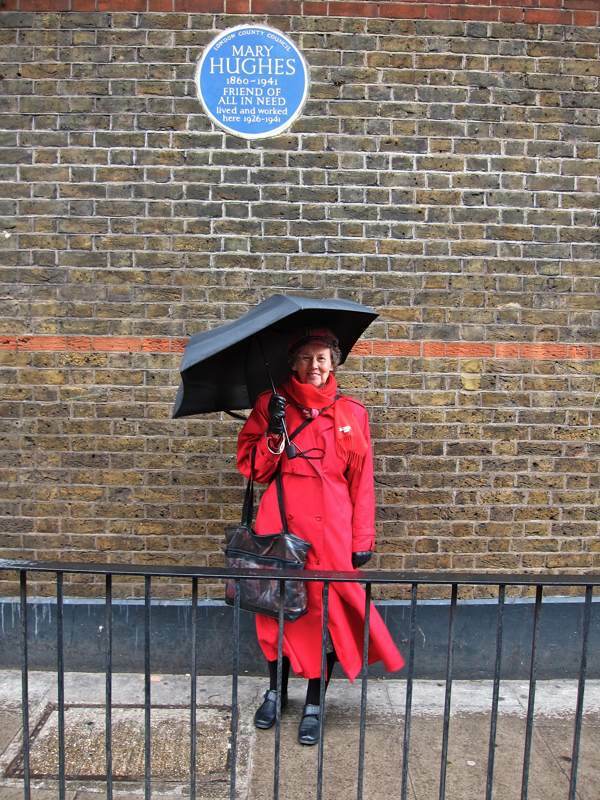 A great heart and a formidable spirit, the soul of her neighbourhood, truly the prima donna of Spitalfields. We love you, Mavis. More power to your elbow. Long may you roam. Have a lovely birthday! This was a great post. Happy Birthday from Melbourne, Mavis. I loved reading about your life’s adventures and events. I don’t doubt our Gentle Author’s word – but really – looking at the vibrant, beautiful woman in those photographs I had to go back and triple-check your given age! Happy Birthday to a fantastic lady! Happy Birthday Mavis !!! inspirational ! A Very Happy Birthday to you, dear Mavis. I remember you well from my time in Spitalfields in the 1970s, first as an alcoholic derelict who found salvation in the Crypt at Christ Church, then as a regular at worship in Hanbury Street soaking up the teaching of the remarkable Eddy Stride. If you recall me at all – I’m a Scot, by the way – it might be when, on returning to the Crypt to work there, I lived in 47a Brick Lane with my new wife Alice, an Australian Salvation Army officer I met when she was visiting the UK. We left for Australia in 1979 and, after many years in Canberra, now live in retirement on the NSW South Coast. We have been blessed with a son and a daughter, both Christians, and – so far – two grandchildren, both boys. I thank you, Mavis, for being one of those who made all that possible, for, without you and others who stood firm and faithfully served the Lord in Spitalfields, “a wretch like me” would not have experienced such amazing grace. I was in London last year and had the pleasure of catching up with Derek and Tej Stride after attending Sunday worship at Christ Church. If I visit again, I will certainly make sure I catch up with you, too. Having no contact with my birth mother and biological brother for their respective birthdays this week here in Oz ensured the proper personal blubbering’s (altogether sweet) just now upon the ‘sensory immersion’ into Birthday Girl Mavis Bullwinkle’s life. Thank you & Happy Birthday Mavis. Lovely – wishing Mavis a very Happy Birthday! happy Birthday Mavis! You are just the best! . where did you get the coat? With all best wishes on your Birthday Mavis! May good health continue to be with you. You look absolutely beautiful. Such a graceful lady. What a great story! I was born in Hackney and still live there today – I’ll be 60 next year. Have a wonderful day Mavis Bullwinkle. Happy birthday Mavis – I really enjoyed reading this post on this day which also happens to be my birthday. A very happy birthday from Amsterdam, Mavis. What a wonderful story yours is. Have a fantastic day! What a wonderful story, and beautiful pictures. Happy birthday from Cambridge, Massachusetts! Happy birthday! Love your stylish red outfit. If I look as good at 80 as you do, I shall be very pleased. Hope you have a lovely day. Mavis what credit to the East End you are. I think they must have got your date of birth wrong or the photos of you were taken 20 + years ago. You are and must have been some looker. Happy birthday, Mavis. These stories about you are so interesting, and you sound like an amazing person. I wish you all the best! Mavis: Happy Birthday!!! This is wonderful of you to share so much about your neighborhood. What a special day. Thanks for doing this post. Happy Birthday Mavis! Thank you for sharing your story. You are a great lady with a wonderful name. Happy Birthday my dear friend Mavis. May the Lord bless and keep you! I do enjoy our prayer/Bible studies especially when you take it. You look lovely in that bright coat and you don’t look your 80 years! Happy Birthday to you , Mavis , I enjoyed reading your lovely story. 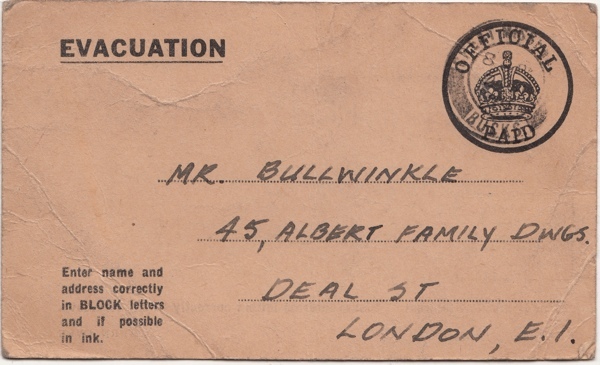 All my father’s family lived in Spitalfields – (Butler St.) now Brune St.
and my mother (b. 1923 ) , lived at no. 73 Buxton St.
old houses that are still standing and it brought back memories of her. Many Happy Returns from the Blue Mountains in Australia! How you glow in your wonderful red coat with a glowing smile to match. Remember, eigthy is quite young really (I turned 80 one month ago). Love and all good wishes to you. Happy birthday to a wonderful lady in a stunning red coat! A beautiful post, and I wish you many happy returns, Mavis, on your birthday. happy birthday, beautiful miss mavis. new mexico sends you dust and chiles and cactus flowers and many, many happy returns of the day. …oh! i’m a day late, but i’d like to add my birthday greetings to you. I hope you had a lovely day Mavis. Not just a beautiful face, but one of the kindest too. Wishing you a wonderful birthday! You are a bright star of Spitalfields! I hope you’ve received the cd of our interview. Thank you for the lovely photos and the good read. Mavis is an inspiration! Happy Belated Birthday! sorry this is late, every good wish and every rich blessing, I will always remember our times together in Spitalfields young peoples fellowship under T C Ralph, of which we were growing in Christ together, Love, henry. A very belated Happy Birthday, Mavis. I wonder whether you’ve noticed that the the photo of you in front of the war memorial at Christ Church, where your father tended the surrounding garden, is also shown in the photographs shown recently in the post about John Claridge. The photo’s title is ‘Hot Dog Van, Spitalfields 1961′. Maybe your father tended the plot as immortalised in this shot. It would be so nice to think so. Hallo Mavis and and I hope you had a very happy birthday. I was brought up in South East London (part of Buzz bomb alley) during the war but I have an emotional attachment to the actual east end, particularly Buxton Street. My ancestors lived in the Spitalfields and Bethnal Green areas since the 1500s. Your mention of the Prince of Wales pub on the corner of Deal and Buxton streets was of particular interest to me as my Great Grandfather ( James Vincent Needham) was the publican of that pub in the mid 1800s. His Father, George Needham, had the Duke of Norfolk pub in Ivimey Street, Bethnal Green. On my Mothers’s side was the Bay family living in the Norton Folgate area for generations. I now live in Australia but would really like to get hold of a photograph of the old Prince of Wales pub. Any thoughts? Anyway from one East Ender to another – Many Happy Returns. What a remarkable and beautiful lady, and such a snappy dresser! 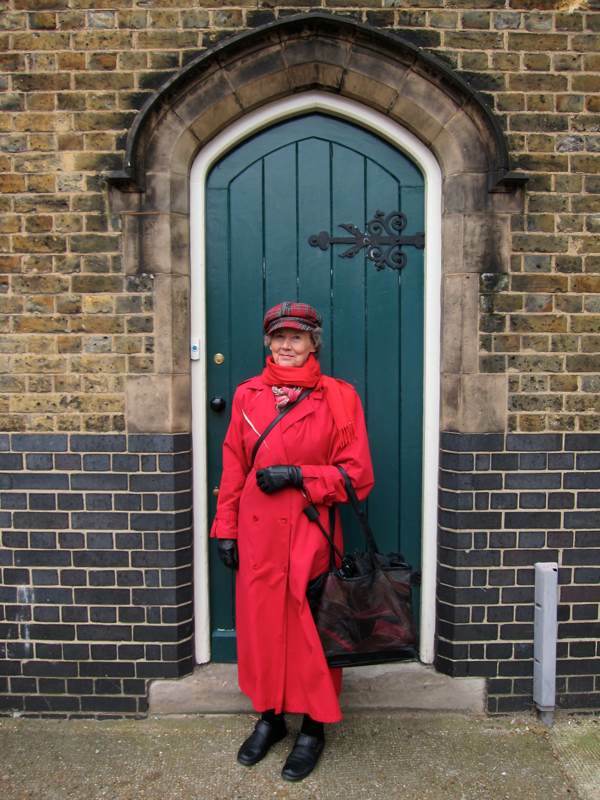 Wonderful “Lady in Red”–this article makes me want to meet Mavis in person. What a delightful woman with a interesting history. Thank you.